Sooooo Good! Rebecca Taylor Spring 2015 Sample Sale Report. I was hesitant to go to the Rebecca Taylor sample sale as I can usually find her dresses marked down to $30-40 at the Rack but I'm so glad I didn't skip it. So good. I'm just gonna keep saying it. Because it was. Tonight was VIP and Gilt City only. (Gilt sold a $10 early entry that was worth every penny IMO.) Don't worry - a little birdy told me that they had more samples that would be going out in the morning. I'm almost tempted to return tomorrow to see what else I can find. Let's start with pricing. Here is the ready to wear pricelist. Jewelry and accessories (didn't really see any) start at $29 and prices top out at $199 for outerwear and $299 for leather. You know me, I went right for the back and hit the samples hard. Here's the sample price list. Leather for just $125 is your best bet. Outerwear is $100, dresses are $50 (oh, yeah!) and tons of cute blouses and sweaters for $40 each. I saw a rack full of $30 pants but not a single skirt and we were the first thru the door. I tried on a few cute $25 tops but sadly none of them worked for me. Samples were all sized 2 or 6 with a few exceptions. Sizing was all over the place because a few size 6s were snug and I actually ended up purchasing a few size 2s (and we all know I'm not a 2). My partner is crime was once again V, who could have probably used a 0 but managed with a few 2s. She took home an amazing shearing coat that I found for only $125 (in addition to a couple of pretty sweet $50 dresses). She actually ended up wearing the coat home because is was pretty chilly out. I spotted a similar (but not as cute) shearing still on the sample racks before I left. This $40 oversized sweater vest is so long I may wear it as a dress. I love the texture. $495 Charlotte studded silk and lace dress for $50? Yes, please! $550 leather paneled dress, $50. Silk patterned dress, $50. Such a easy, comfortable summer dress. I love the subtle hi-low hem. I found this wrap dress in a different pattern online at both RT and Nordstrom for $425. This $50 crochet lace dress was just so interesting I just couldn't leave it. I found it online in white at Neiman Marcus for $495. It was this $50 printed silk dress that made me realize I needed to try size 2s too. It's totally see through so I'll be wearing it with the slip from the crochet dress. 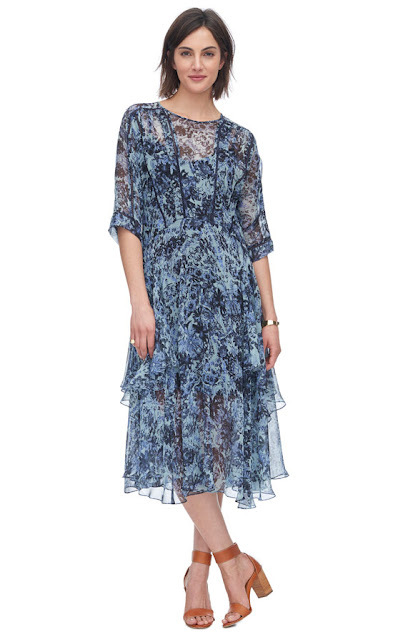 I looked it up and it's called the Kiku print midi layered dress ($550) and it should have had a light blue slip. Oh, well. In case you haven't noticed, my camera is on the fritz (I'm gonna upgrade again soon) so a lot came out blurry but here are a few pics from around the sale. Stock was all neatly arranged by size. They also had some cute shoes (all blurry) for $100 but I like to spend $50 max on non-super designer shoes. The only $29 accessories that I spotted were these handful of belts. They have a fitting room and you can only take 10 items in max - the line was long all night and they don't hold anything so it's probably best to shop with friends who can hold your keepers outside while you try on. My recommendation is to get there early because if you're a girly girl (and can fit a size 2-6), this is the sale for you. Tuesday, June 2nd thru Saturday, June 6th.